Sixty-five years ago, the ship ‘Castel Verde’ departed from Trieste, with 600 emigrants on board, headed for Australia. In the excerpt published below, Romeo Varagnolo remembers the event which gave origins to the biggest Triestian emigration in history. “The inter-governing committee for emigration would like to announce the departure of the steamship Castel Verde from Trieste, which will carry to Australia the first contingent of 600 emigrants from the area, and leaving on March 15, rather than March 13, as previously indicated. 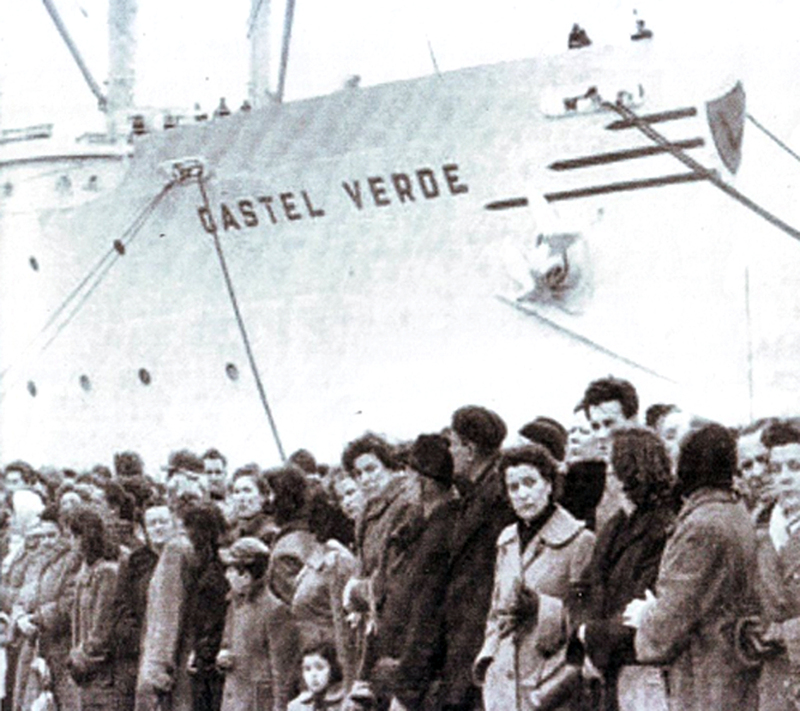 And so it was that March 15, 1954, became a historical date, as Castel Verde departed Trieste for Australia, paving the way for the biggest Triestian emigration in the history of the city. The number of emigrants from Trieste and Friuli-Venezia Giulia is thought to sit between 20,000 and 22,000, due to a conflict in data, poor documentation and the sensitive politics of the time. But it is likely that in less than six years, 10 per cent of the population of Trieste chose the way of Australia. The motivation which drove more than 20,000 Triestians to emigrant to Australia cannot simply be tied to the events of World War II, as is often done, and in particular to the Italian exodus from the territories which were ceded to Yugoslavia, but also to the profound sense of distrust, disenchantment, and worry for an uncertain and stagnant future, typical by this time of the border-city, where between Italy and Yugoslavia a worrying atmosphere of Cold War reigned. Triestians remember all too well the tragic occupation made by the Yugoslav troops who for 43 days, from May 1 to June 13, 1945, took possession of the city with disastrous and tragic consequences. In less than five years, from 1940 to June 1945, the Province of Trieste passed under the administration of five nations: Italy, Germany, Yugoslavia, England and the US, returning to Italy only in 1954. Trieste, even if happily reunited with Italy, seemed abandoned to its destiny. The shipbuilding, metallurgic and commercial industries were in progressive crisis. The city was overcrowded; thousands of exiles took up residency in Trieste with a 20 per cent increase in overall population. Another problem arose following the firing of the civil staff of the ex Allied Military Government, and from the “suggested” and “sweet-coated” mass dismissals of Giulian staff from the Civil Police, who were rapidly replaced with staff from other areas of Italy. In this chaotic atmosphere, the idea of emigration overseas became always more tempting, so much so as to seem like the only solution to the socio-economic instability of the city. At this point in the history of the city of Trieste, Australia enters to the sound of grand fanfare. Australia: the country of easy earnings, the land of kangaroos, situated on the other side of the world and attempting desperately to populate itself, and to develop its immense land. Australia saw in the city of Trieste a source of immigrants of primary choice. The country quickly began releasing propaganda to entice giuliani to immigrate to Australia. “The more the better,” was the Australian motto. Specialised workers, technicians, professionals and a good part of the ex-members of the Civil Police (all in possession of trustworthy references after nine years of service in the Anglo-American administration of the Allied Military Government) were enticed. At that time, Australia, with a population of less than 10 million inhabitants spread throughout an area that in greater in size than Europe, seemed the obvious solution to every problem. Reason lead the way and the Triestian youth climbed on board the ship with a smile on their lips. Some of the emigrants however were the heads of the family, who were continually in search of a secure arrangement, one that was decently paid, and who saw in Australia the opportunity to resolve tomorrow’s uncertainties and the future of the children. A resolution that certainly carried through, even if it came with sacrifices. This story appeared in the Thursday March 21, 2019 edition of La Fiamma. Romeo Varagnolo is Community Contributor at La Fiamma.